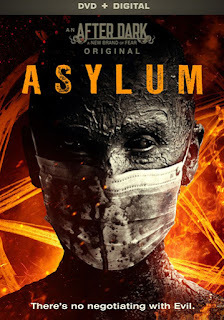 Get ready for an insane ride when visiting Asylum, checking in on DVD (plus Digital), Digital HD and On Demand June 2nd from Lionsgate Home Entertainment. From the iconic horror brand After Dark Originals, Asylum stars Stephen Rea (Underworld: Awakening), Bruce Payne (Vendetta) and Caroline Ford (Still), and will be available on DVD. A veteran hostage negotiator’s next call leads him to an overrun insane asylum. There, he discovers that dark forces are pushing the patients to commit atrocities, and he may be the only one that can stop them. Bigger stars you will know by face, than by name... why oh, why was this a "dork" film. It had so much potential to be something better than what it turned out to be.